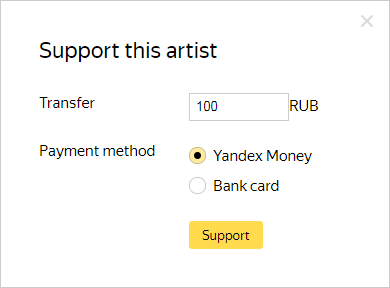 If an artist posts a Support button on Yandex Music, you can send them money. Note. There may be a commission for the transfer depending on your account currency and the bank that processes the payment. Ask your bank what their commission is. 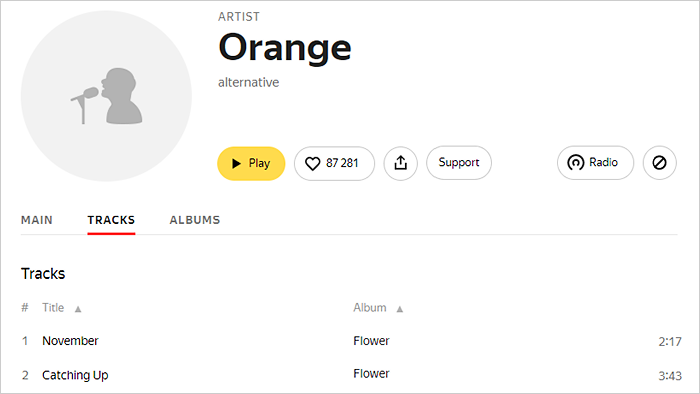 Click Support on the page. If paying with Yandex.Money, enter your payment password in the Yandex.Money system. When you pay with a bank card, enter your card information: the number, expiration date, first and last name, and CVV/CVC code. Click Pay. Restriction. There is a limit to how much you can pay using a bank card: 15,000 rubles at one time, 100,000 rubles per day and 200,000 rubles a month.